As a Business to Business (B2B) Marketer, your leads and achievements are your lifeblood. But what does it take to become an indispensable marketing professional? Learn how to not only keep your job, but provide the best turnaround to your company with these five skills you need for success in 2014 and beyond. What does it take? Each day, marketers face new challenges and opportunities to get the most from marketing programs. How can you reorient yourself and your programs for optimized growth? Companies are adopting CRM and salesforce automation (SFA) systems to make their sales teams more efficient, and to make their marketing teams more accountable. People who implement CRM systems for companies will tell you that of all company departments, marketing is often the most resistant user of CRM systems. I’m sure part of this is due to the technical intimidation many of us feel when being faced with using new technology in our jobs, but in many cases, what marketers are running away from is the accountability CRM brings to marketing, by the precise measurability CRM introduces to this process. Accountability is your friend. It allows you to prove your worth to the organization and organize your team to serve potential customers better. Without CRM, how will you know the effectiveness of your abilities to generate sales response (leads, open rates, landing page click-throughs, or any other result that generates a lead? Why would anyone want to be in a job where they weren’t producing tangible, measurable results? Think of CRM as a new tool for helping you “up your game” as a marketing professional, to develop more effective marketing programs. Because a CRM platform can efficiently automate, track, and measure any marketing program, these features also make CRM systems a required tool for establishing lead development programs. As companies continue to apply IT-based approaches to business processes, CRM will only grow in its application to business-to-business marketing programs. The transparency and efficiency CRM systems bring to your marketing program can improve your competence and skill as a marketing professional, but only if you accept this change as a challenge to meet, and not a threat. As part of their marketing programs, many companies lack formalized, ongoing lead development programs. This is a systematic, continuous communications program, run by marketing that works alongside your sales team to communicate with prospects alongside your company’s sales team throughout your company’s sales cycle. Establishing a lead development program means assessing the length of your company’s sales cycle, and evaluating the information your prospects will require on your company, its product, and its applications and benefits, as they communicate with your company’s sales reps. For more information on aligning marketing and sales, please view our post on the topic. Lead development and “triggering events:” In addition to making lead development an established communications process, think also about how you can help your company’s sales team respond to what Jill Konrath, author of the book Selling to Big Companies, calls “triggering events.” These are sudden, major changes in the prospect’s company that create a more favorable environment for closing a sale. Properly handled, each one of these events provide an opportunity for you to help your company’s rep on the account establish the dialogue that raises the probability of closing the sale. CRM systems play a major role in lead development programs and executing responses to triggering events, since most lead development activities involve e-mail communications and sales rep contacts, both of which can be executed and closely tracked and measured in your company’s CRM system. Next to the obvious benefit of improving prospect conversions through more effective marketing, running an effective lead development program that can be measured using CRM allows you to measure the total impact of your marketing program, by tracing new business closed on a prospect back to the original ad, mailing, trade show or other activity in your program that led to the prospect’s initial contact. This makes your marketing program accountable to your senior management, and keeps you solidly involved in your company’s sales process. Your company’s sales team is looking to you to provide the essential pre-show and on-the-ground marketing execution and support, and post-show lead handling and followup to maximize the value of your trade show schedule. Establish and stick to a firm policy on lead qualification and ongoing inclusion and follow-up on generated leads with your lead development program. Think of your marketing program not as a schedule of campaigns and tactics, but as an infinite series of opportunities to reach many types of prospects in your market who represent opportunities to do business with your company. Then, think of the most effective and efficient ways to reach these groups. Third, and most important, don’t ever let yourself get too comfortable with your current marketing program. Put out the extra effort required to develop, test, and execute additional marketing projects to test new ideas, markets, and opportunities. Testing is an important feature of every marketing program, and your best insurance against marketing program failure. Dedicate a small portion of your budget to testing, and do this continuously. If you are constantly testing different ad formats, direct mail pieces, mailing lists, and other variables in your marketing program, you are not only enhancing your knowledge of what’s effective and what’s not, you are hedging your bets in case one or more of your ongoing marketing activities suddenly pulls less response. The most important part of every indispensable marketing program is you. Now is the time to get yourself more productive, and to work on developing the professional skills you will need to better execute marketing programs that generate leads and conversions for your company or client. Get productive by changing your work habits and stop Multitasking. The myth that people actually get any real work done by “multitasking” is killing our country’s productivity—and probably yours. Set aside uninterrupted, timed, half-hour blocks of time with short, 5-minute breaks in between for intense creative and planning work. This helps you regain your attention span, sharpens your focus and creates an environment where you can be productive at any task that’s not only important to your job, but critical for getting ahead. Spend some of this new time you’ve found studying your craft of marketing: Read (or re-read) the classics of advertising by John Caples, Claude Hopkins, Rosser Reeves, and other Depression-era copywriters. Study every ad ever created by any of these guys. If these classic masters of advertising were able to create successful advertising in the Depression, what they have to teach us today is likely to work just as well in the tough economy to come. Go to libraries and used bookstores and get hold of as many old magazines (especially trade and industrial publications) from the 1930s-1940s, and study the ads in these old issues for clear headlines, expression of benefits, offers, layout, and copy presentation. Don’t forget that these ads were selling in the midst of a Depression mindset, and often used powerful, no-nonsense sales copy and layout presentation to move their company’s products to tight-fisted buyers. Knowing how to write an effective ad, knowing the elements of an effective layout, and knowing the critical steps involved in executing every type of project in your marketing program makes you a better and more effective manager, even if you’re not doing these things yourself. We would like to thank the Business Marketing Institute for the inspiration. We invite you to check out their full article: The Indispensable Marketing Professional on their website. 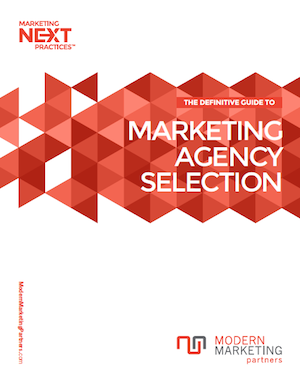 Please Follow Modern Marketing Partners on Twitter, and contact us if you would like to become indispensable by selecting the right marketing agency to assist you in meeting your B2B Needs. Have something to add? Share it in the comments section below.